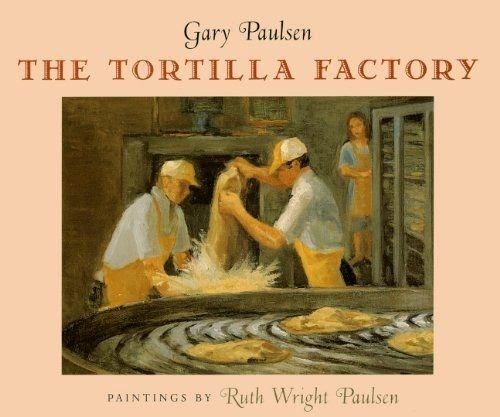 With spare and measured prose (a total of 134 words), accompanied by thick, unsaturated oil paintings on linen, author and illustrator present a circular telling of the elements involved in the process of making tortillas—from working the earth to planting the seeds to harvesting and grinding the corn into flour to shaping and baking the tortillas. Both the pastoral settings and poetic language—“black earth” worked by “brown hands,” “yellow seeds” that become “green plants” and “golden corn,” etc.—are straightforward and expressive. By concentrating on hands, rather than the individual faces of the workers responsible for the tortillas’ creation, Ruth Wright Paulsen’s warm oil-on-linen paintings demonstrate respect for the ethic of hard work and hold broad, universal appeal. Readers will embrace The Tortilla Factory for its clear emphasis on the simple beauty found in the cycles of life for plants and human beings. What the reviewers left out is this: That the agricultural and factory workers—depicted here in both text and illustration—literally have neither faces nor voices means that they have no agency. All they have is “brown hands.” Both author’s and illustrator’s “clear emphasis on…simple beauty” deftly erases the backbreaking labor of agricultural workers, erases the decades old “fight in the fields” for justice and fair wages, erases the omnipresent danger of cancer-causing pesticides; and, indeed, erases everything that Edward R. Murrow’s TV documentary, “Harvest of Shame,” brought to public attention in 1960—55 years ago. A few words about multiculturalism and power dynamics: For all intents and purposes, The Tortilla Factory can be considered both “multicultural” and “diverse” because it portrays people with “brown hands.” By minimizing and romanticizing agricultural and sweatshop work, by referring to and depicting ethnic workers only as “brown hands,” by disappearing poverty and real struggle, author and illustrator—intentionally or not—elevate white people and subordinate everyone else. By erasing their voices and erasing their hardships—by (please forgive the following metaphor) neatly wrapping farm workers and factory workers into tortillas of pastoral prose and paintings, both author and illustrator romanticize their subjects to leave child readers (if they are not themselves agricultural workers) peering, as strangers, from the outside in. And for children who are agricultural workers and happen to come upon this book, there is only shame. The Tortilla Factory // La Tortillería are not recommended. “Harvest of Shame” was aired on CBS Reports on the day after Thanksgiving, 1960. For an excellent discussion of this topic, see Stuart H.D. Ching’s essay, “Multicultural Children’s Literature as an Instrument of Power,” in National Council of Teachers of English’s Language Arts, vol. 83, No. 2, November 2005.